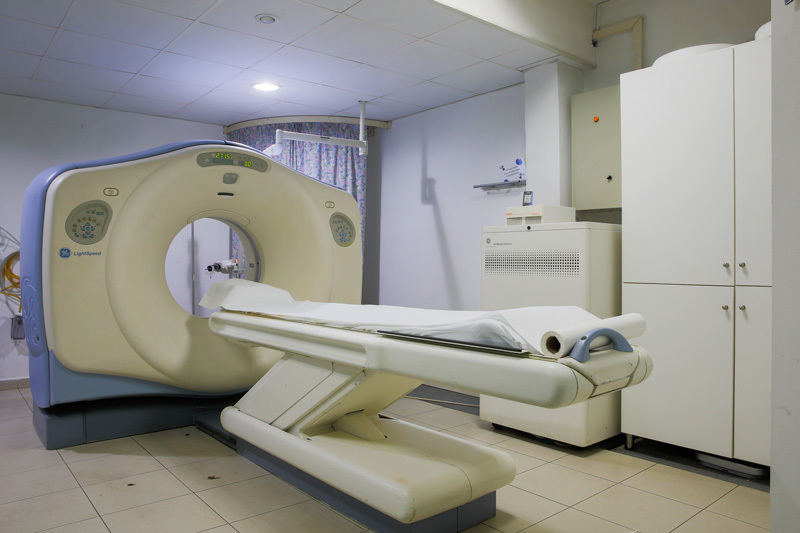 The Radiology department is composed of a multi-slice helical CT Scan, a Digital Mamography machine, Ultrasound machines, a Panoramic dental Xrays and the Digital Radiography system. It is organised in modern accommodations including dedicated CT/MR, ultrasound and private intervention suites. The multi-slice helical CT scan General Electric is an advanced radiological imaging that uses an x-ray beam that rotates around the patient to capture pictures inside the body. The CT procedure is fast and painless, and allows the acquisition of three-dimensional high definition images. The Digital Mammography is an x-ray examination of the breast used to detect cysts and cancer. It is one of the best methods to find a cancer before it can be felt; Mammography, biopsies, galactograms and wire localizations of the breast are performed at our hospital. Our new Samsung’s Accuvix A30 Ultrasound System establishes a new benchmark for state-of-the-art imaging. Offering features such as its 21.5-inch full HD large screen LED monitor combines with enriched 3D and 4D performance to deliver uncompromising image quality for increased detection rates, this system facilitates clinical decision-making and boosts diagnostic confidence. Another portable Samsung 3D and 4D ultrasound machine is specially dedicated to anesthesiologists for pre-operative peripheral nerve blocks guidance. Diagnsotic Radiography: we use Digital Radiography and Computed Radiography remotely controlled machines which rely on the picture archiving and communication systems (PACS) for transmission and storage of the digital images. Goniometry is also available to orthopaedic surgeons to measure the range of motion of body joints.